Cotton/elastane. Crafted from soft cotton-rich sateen, Capture's breathable and comfortable Printed Pant comes in a range of colourful prints that are sure to liven up your everyday wardrobe. 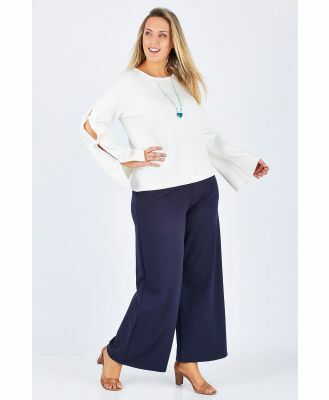 These flattering and fashionable pants are styled with a fly front with hook and clasp fastening, belt loops, front angled pockets and mock back pockets. • Breathable cotton-rich sateen • Flat waistband • Fly front with hook and clasp fastening • Belt loops • Front angled pockets • Mock back welt pockets • Back waist darts • Inner leg measures 71cms The model pictured wears a standard size 10. Style yours with a white chiffon blouse and flats for work, and switch to sneakers and a cotton tee on off-duty days.